We have 15 acres of land for our home and kennels. Our perimeter fencing is stock-wire and dog proof. There are 8 large covered kennels approximately 15′ x 30′, additionally we have 4 indoor kennels each 10′ x 12′ which are, heated and air-conditioned with access to a 10′ x 12′ outdoor run. Our dry conditions also have benefits, we have no fire-ants, very few fleas and very few ticks, our dogs rarely get hot spots or ear infections from moist conditions. Even in the hot summer months, with the low humidity, it is not uncomfortable outside and the evenings and mornings are always cool usually in the mid 60 ‘s. 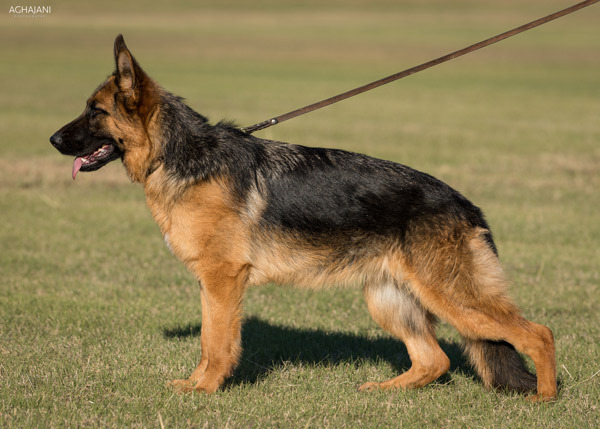 Our schutzhund club, Palo Duro Working Dog Club, meets at our facility and we hold trials, shows and korungs. Having the Club here gives our puppies and young dogs the opportunity to see and experience a variety people and situations, which is very beneficial in their development.